For other uses, see Pianist (disambiguation). 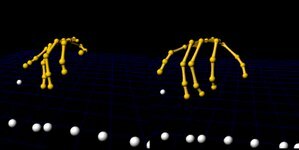 Motion capture of two pianists' fingers playing the same piece (slow motion, no sound). A pianist (/ˈpiːənɪst/ PEE-ə-nist, /piˈænɪst/ pee-AN-ist) is an individual musician who plays the piano. Since most forms of Western music can make use of the piano, pianists have a wide repertoire and a wide variety of styles to choose from, among them traditional classical music, jazz, blues, and all sorts of popular music, including rock and roll. Most pianists can, to an extent, easily play other keyboard-related instruments such as the synthesizer, harpsichord, celesta, and the organ. Modern classical pianists dedicate their careers to performing, recording, teaching, researching, and learning new works to expand their repertoire. They generally do not write or transcribe music as pianists did in the 19th century. Some classical pianists might specialize in accompaniment and chamber music, while others (though comparatively few) will perform as full-time soloists. Mozart could be considered the first "concert pianist" as he performed widely on the piano. Composers Beethoven and Clementi from the classical era were also famed for their playing, as were, from the romantic era, Liszt, Brahms, Chopin, Mendelssohn and Rachmaninoff. From that era, leading performers less known as composers were Clara Schumann and Hans von Bülow. However, as we do not have modern audio recordings of most of these pianists, we rely mainly on written commentary to give us an account of their technique and style. Jazz pianists almost always perform with other musicians. Their playing is more free than that of classical pianists and they create an air of spontaneity in their performances. They generally do not write down their compositions; improvisation is a significant part of their work. Well known jazz pianists include Art Tatum, Duke Ellington, Thelonious Monk, Oscar Peterson and Bud Powell. Popular pianists might work as live performers (concert, theatre, etc. ), session musicians, arrangers most likely feel at home with synthesizers and other electronic keyboard instruments. Notable popular pianists include Victor Borge who performed as a comedian; Richard Clayderman, who is known for his covers of popular tunes; and singer and entertainer Liberace, who at the height of his fame, was one of the highest paid entertainers in the world. Many important composers were also virtuoso pianists. The following is an incomplete list of such musicians. An amateur pianist playing outdoors at Pike Place market in Seattle. Some people, having received a solid piano training in their youth, decide not to continue their musical careers but choose nonmusical ones. As a result, there are prominent communities of amateur pianists all over the world that play at quite a high level and give concerts not to earn money but just for the love of music. The International Piano Competition for Outstanding Amateurs, held annually in Paris, attracts about one thousand listeners each year and is broadcast on French radio. It is notable that Jon Nakamatsu, the Gold Medal winner of the Van Cliburn International Piano Competition for professional pianists in Fort Worth, Texas (1997) was at the moment of his victory technically an amateur: he never attended a music conservatory or majored in music, and worked as a high school German teacher at the time; it was only after the competition that he started pursuing a career as a classical pianist. The German pianist Davide Martello is known for traveling around conflict zones to play his moving piano. Martello has previously been recognised by the European parliament for his “outstanding contribution to European cooperation and the promotion of common values”. ^ Goebl, W.; Palmer, C. (2013). Balasubramaniam, Ramesh (ed.). "Temporal Control and Hand Movement Efficiency in Skilled Music Performance". PLoS ONE. 8 (1): e50901. doi:10.1371/journal.pone.0050901. PMC 3536780. PMID 23300946. ^ Andreas, Møller. "Professionel pianist leverer dinnermusik til jeres fest af højeste klasse". Pianomusic.dk. Retrieved 19 October 2015. ^ Bucks, Jonathan (15 November 2015). "Paris attacks: pianist 'drove 400 miles through the night' to pay tribute". The Guardian.